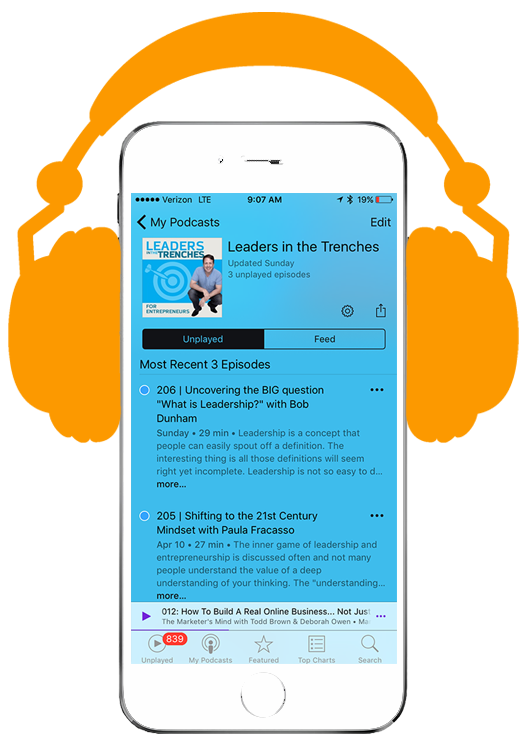 In the podcast interview with Daymond John, we talked about leadership and growing fast companies. We dive deep into Daymond John goal setting strategies too. We got to a point in the interview when I asked him about productivity. The moment shifted as he got intense about success in today’s distracted world. John looked me in the eye and told me that he constantly makes a conscious effort to set goals, rather than letting other people set goals for him. “I think it’s the number-one reason for success or failure,” he added. This is the full transcript of the interview with Daymond John. I am your host, Gene Hammett. Daymond John goal-setting strategies are simple and powerful. Gene: So Daymond, I just saw your speech up there, talking to the Adobe Partners, I want to ask you, how do you prepare for a moment like this? Daymond: You know they’re asking me questions that are natural and real, so there’s no preparation for it, per se. I mean, if it was a, scheduled keynote, then yeah they go the day of preparation, to what points do I need to hit, but today’s off-the-cuff, asking me very personal questions that I have, I better know the answers to! Gene: ‘Cause they’re personal, right? I write about fast growth in leadership. And I’m curious around, what are some of the core principals of successful entities that you’re involved with, with the leadership, and what they’re doing? Daymond: Well the leadership is decisive, they have one-year, three-year, five-year plans, which they know can easily be altered due to change in climate, competition, technology, they fail fast. They allow their upper management, as well as other people, to fail as well, and they give them this entrepreneurial mindset. They make sure they invest in the future because they know that the future is not promised, that they’re going keep doing the business the way they’ve been doing. Gene: So you said something I want to dive into. I write a lot about this entrepreneurial spirit that is very common at the top levels, you have it, I have it, and our companies do. Companies that foster it at all levels of the company are growing faster than others. Gene: Are you seeing that too? Gene: What really activates the entrepreneur spirit from your perspective? Daymond: Well it’s to allow people to feel like they won’t get penalized for trying. And to make sure that people know that they have to work within a system of other people. That they’re not the end-all be-all of it. So, that’s the number one thing, you know, this whole thing of, if they don’t necessarily know how they’re gonna get there, and sometimes you know the people they’re working with are the ones who are really good at data, or analytics, and showing them the path of what they did. And then you have the dreamers, who kind of put it all together, but yeah, they’d be able to work within the system like I said. You know, most of my top management is like, they’re Swiss Army Knives, they know how to jump into various different areas, learn the system, and bring out the fundamentals of it. Because the fundamentals are not gonna change in any area, it’s just gonna be, how are you gonna actually execute it, per deal, or per product or brand or service. Gene: So I just came out with research where I interviewed 51 of the Inc. 5000, the CEOs, and I asked them a big question: How do you motivate your employees to take responsibility for those big goals? What would you say the answer to that is? Daymond: Allow them to accept the goals. Gene: Yes, yeah. So it’s really about ownership. Daymond: Yes, it’s ownership. Responsibility is something that must be taken, it can’t be given; allow them to set the goals. But also, make sure that the proper reward is there. Why are they there? What do they each individual, what do they want from it? Some may want to be recognized, some may want a financial reward, some may want the challenge. You know, some may want to hopefully become a partner one day. But, you know it’s a very personal thing, you gotta find out, I ask them to put themselves in two to five words, to put success in two to five words. It could be 10 words, but once you know what’s driving them, what’s driving them could be just I want to be a great father, and a great mother, and I want to make sure that I’m home every single day with my kids, I don’t want to travel the world anymore, but I know people globally. Okay well, how can I put the assets around you to help you be that person? Some say, I want to travel the world globally. 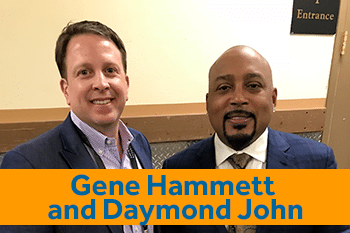 Daymond: You know everybody is, it’s a very personal matter to them, but if you give them everything they want then, you know the failure ratio is much less. Gene: So, what would be non-obvious or counter-intuitive to these hyper-growth companies that you see? Daymond: I’ve seen small things break down the walls in offices, and put a bunch of standing desks there. Put the, you know, make sure the environment itself is conducive to people who want to work. If you wanna, if, we’re in the middle of Vegas here, and people gamble all night long because they’re pumping oxygen in the casino, and why wouldn’t your people be more willing to work harder, stronger and faster if you have clean air in the systems around there? You know, people are, they’re at work more than they’re at home, right? And if somebody’s sitting down all day long, and if sitting is the new smoking, then if you have a standing desk, and a bunch of other things, in the same way, you look at the Facebooks of the world and they have full-fledged gyms and healthy cafeterias and things of that nature, it’s all about how can you get the best production out of a person if they’re not feeling good about their environment they’re in. So the environment could be hurting them physically, mentally, emotionally; lights, you know there’s a lot of things, that I find, because you know, I’ve been in a space where I’ve had creative people most of my life, if you put a designer in a square room where there are no windows there, stats have shown, you’re gonna get 50% of the product you want out of them. Because they have no place to dream. They can’t look outside. Gene: So you mentioned on the speech that you were just talking about, the Q&A, about passion projects, giving 15% of time to individuals to innovate and do something they are personally involved with. Have you seen a specific sesh you could share with us, about that? Daymond: Well 3M is known for doing it, and so is Google, that’s how even Gmail came up, and studies have shown that and my company we aren’t as formal as here, 15 to 20 percent don’t come in on Fridays because they’re supposed to do this, but anybody who’s brought passion projects to the company um, and they feel there’s a strong belief in it, we have seen change and we have seen things grow, and at first you know, people may have objected to it, or whatever the case is, and that person said okay, let me go out and bake it a little further and bring it back in, and we’ve seen it work. And, trust me, some of those were my own projects. Gene: That you’ve brought in? Daymond: Yes a new direction I may want to take the company when everybody tells me, you know, I don’t know if that’s working and this and that, and all of a sudden you know, we’re finding that because, you know somebody with a passion project, they’re gonna put in 20 hours on a normal project, ’cause it’s their project, they put in 10. Gene: So it’s back to ownership again. Daymond: Come back to ownership yes. Gene: Leadership, if you can help them, leadership that inspires ownership is driving these companies. The fast-growth ones. Gene: When one critical element of this is one of transparency, you look at it as the mission, kind of companies that have a mission, but have you seen transparency across your companies? Daymond: I think transparency is inevitable, right? You can, you can come out with this great theory of who you are as a company and if your employees are all unhappy and they’re talking on their own time on social media, people can’t differentiate their own time from the company’s time, so if you’re talking about how you’re empowering them and doing all this and that, and that’s just a billboard you’re trying to slap around, or a commercial you’re trying to slap around, when they find out the employees are not happy there, that transparency is still gonna hurt you one way or another. And on the flip side, if you’re doing great things for these people and they want to be in an environment that they don’t want to leave, you know, that transparency also is very infectious to other people. Gene: So we got a few minutes left here, because I wanna be respectful of your time, I recently wrote a book called The Trap of Success. What does that mean to you? Daymond: I don’t know, you wrote the book. Gene: I’m just wondering, from your perspective. Daymond: This is companies or people? Well, they don’t get stuck in a drift, companies get you know, the sales staff goes out, people go out, and people expect them to be perfect all the time. They expect them to over-deliver, and soon, if anything happens where they may fall short, for a little bit, you know, they have to live up to this big, high expectancy, so all of a sudden, you know, it’s easier to point your finger at them and tell them how they’re, you know, they’re not doing well. Also, the laziness of the company, the people who get complacent because they think they can’t be knocked down, and they don’t realize, that everybody can be knocked down if you look at it. Those are successful issues that you may have, um the fact that you may not, if you’re fortunate enough to be like Nike and make a special, one shoe for somebody, even though they’re doing 20 billion dollars, you if you’re fortunate enough to be able to treat the small, everyday person just as well as you treat the large corporation, but many people with large success only start looking at the numbers. And the number crunchers and they take a lot of the emotion out of their decisions, internally as well as with some of their most valuable customers who may be just one person with a big mouth. Gene: Yes. So I always have a practical and actual elements last question of the podcast. So I’m gonna ask you, around productivity, I know you’ve studied this, after what you’ve been through with cancer, and everything, what would be your one aspect of productivity that might not be heard elsewhere that’s really driving you? Daymond: I don’t know if it’s not heard elsewhere, I think it’s the number one reason for success or failure. It’s a conscious effort to set goals. For yourself, personally, emotionally, faith-wise, family, to business. I think that people don’t realize that they’re not in conscious control of the goals they set, they let other people set goals for them. So, you know, the first time I read Think and Grow Rich by Napoleon Hill when I read and understood the practice of setting goals, which is, I read, I have 10 goals that I read every single night before I go to bed, and every single morning when I wake up. Six of them expire in six months, and the other four expire in three years, five years, 10 years and 20 years. And I re-set them every six months, and I never reach ’em. I only get 20% there, 30% there, but I get closer to there. The reason I read ’em before I go to bed is so it’s the last thing I think about, so what I dream about. The reason I read ’em first time I wake up is that’s the first action I take. And you know I attribute that to Napoleon Hill and Bryan Tracy and so many people have written about it, but people take that for granted. So when you’re setting a separate goal, like waking up every morning saying, I’m always gonna be in an abusive relationship or I’m never gonna get that job or that’s never happened in the world or you know, I didn’t come from a wealthy background, or things of that nature, you’re setting up a different goal, that I promise you, you will hit. You will stay in that abusive relationship, or will never get that job, or will never leave that job, if every single morning when you’re on the train, you’re thinking about how sorry your life is and how everybody else is doing better than you, well, don’t feel sorry and then everybody else will do better. Gene: Well I appreciate you sharing your insight there thanks for being here at Leaders in the Trenches and sharing your wisdom. The “Daymond John goal setting” interview was so much fun to create. The energy and insight was powerful in the moment and continues to be something I think about regularly.